Leonardo Da Vinci's Mona Lisa is perhaps the most well-known painting in the world, so it naturally makes a great costume since everyone will immediately know who you are. And yet turning it into a costume can be a pain- unless you're willing to wear a picture frame to complete your costume. 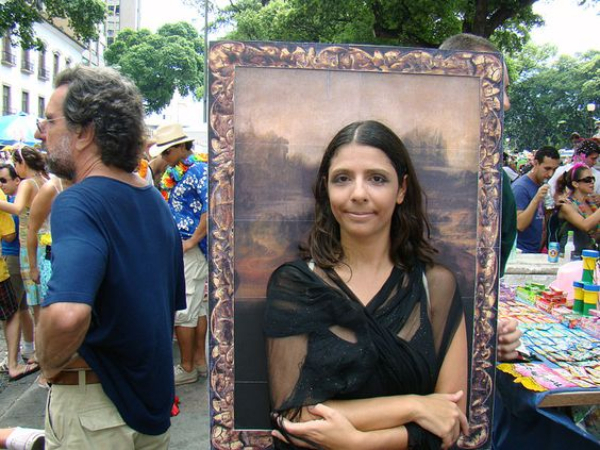 Without the frame you may have to explain that you're Mona Lisa, but with the frame you and your costume look like a work of art! 2Francisco de Zurbarán's "Saint Serapion"
The costume Saint Serapion is wearing in this painting by Francisco de Zurbarán would be surprisingly difficult to reproduce, but photographer Peter Lipmann pulled out all the stops when he had the costume created for his photo for fashion designer Christian Louboutin. 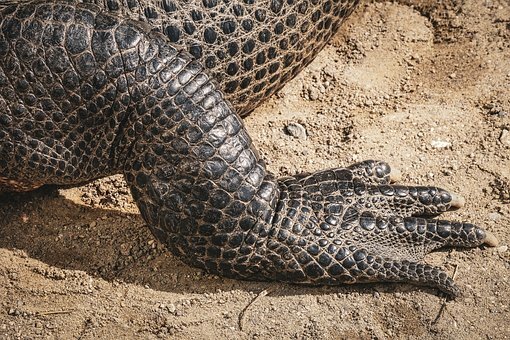 And because of the amazing costume people have a hard time telling the difference between the photo and the original painting, which is a feat in itself. Banksy's "Flower Bomber" is one of the most recognizable and famous works of street art ever created, and this bold yet simple image makes for a really great costume too. 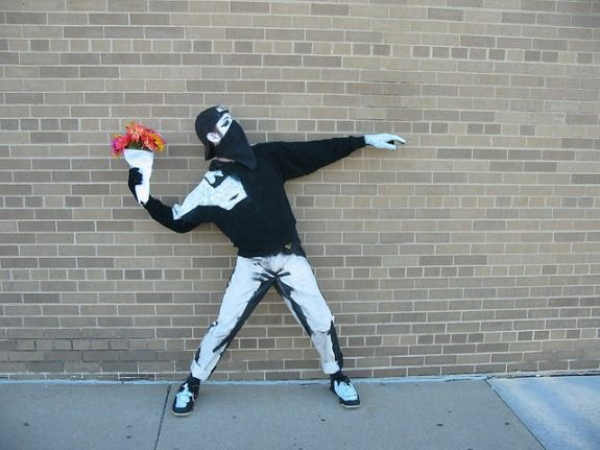 This version of the costume was put together by Jason McDowell back in 2009, and Jason's clean and simple execution of the costume makes it easy to replicate while truly looking like a piece of street art come to life. Who doesn't know and love Gustav Klimt's painting The Kiss? 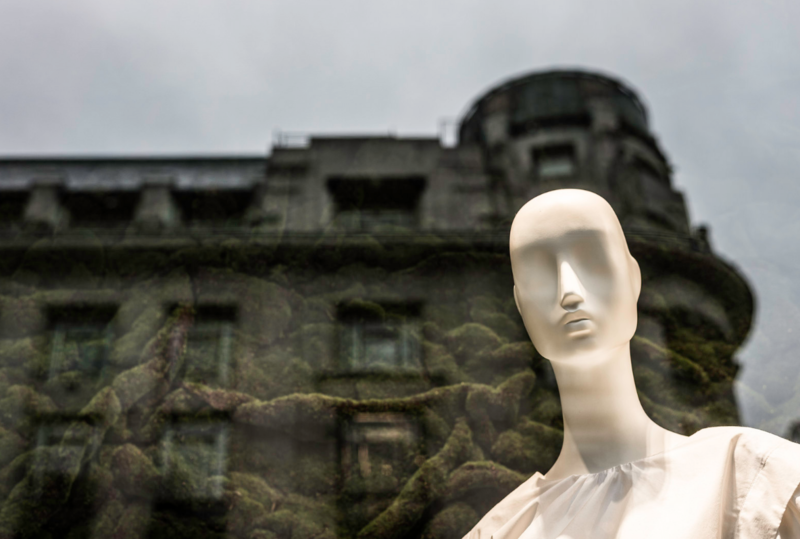 This iconic masterpiece is visually quite stunning, but doesn't seem like it would make for a very good costume. However, as Mai and Bri of MaiBri Photography show us, a couple's costume based on the painting is actually really cool, and makes for a night full of romantic photo ops. 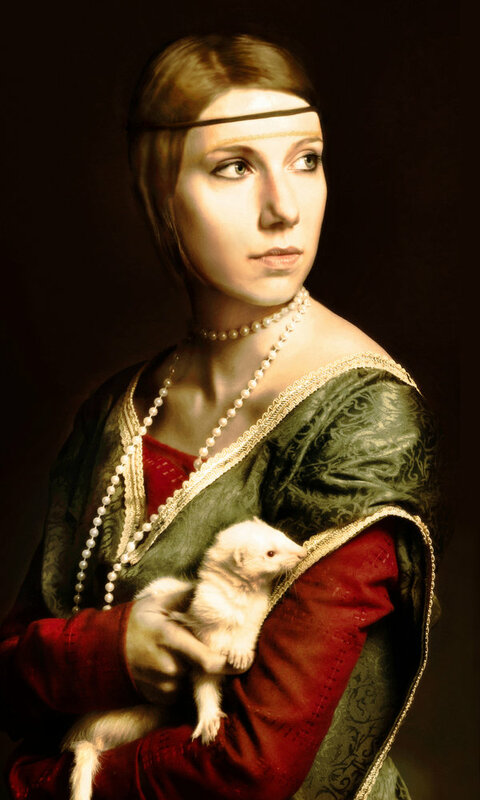 Leonardo da Vinci's classic painting "Lady with an Ermine" may seem like an odd choice for a costume, but if you think about it this look is not only recognizable and photogenic but it's comfortable too. And you get to carry around a stuffed (or taxidermy) weasel all night, unless you're lucky enough to have a mellow white ferret like DeviantArtist SamSeddon's pet ferret Falkor featured in this photo, in which case you can carry around a live one and get all kinds of attention from animal lovers! 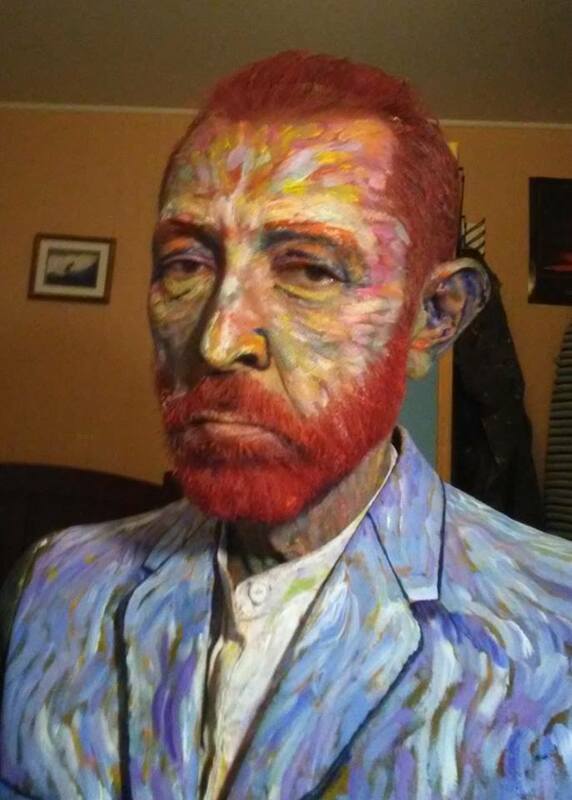 6Vincent Van Gogh's "Self Portrait"
Vincent Van Gogh painted over 30 different self portraits in his lifetime, and they're all instantly recognizable even by those who failed art history. However, turning one of Van Gogh's self portraits into a costume is a tall order, but Redditor vitaefinem's high school art teacher did an amazing job of bringing the master Impressionist's self portrait to life. He even looks like Van Gogh, although he still has both of his ears. Andy Warhol's psychedelic pop art looks really cool hanging on the wall but is surprisingly hard to bring to life with a costume. But the woman featured in this photo did an amazing job of bringing one of Warhol's colorful "Marilyn Monroe" portraits to life with body paint, a wild colored wig and a dress Marilyn would have loved. 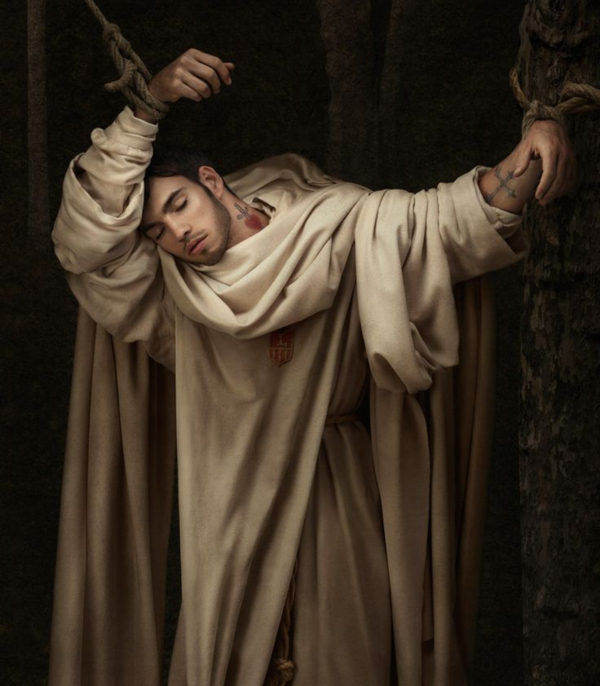 8Peter Paul Rubens' "Saint Sebastian"
If you like your costumes like you like your paintings, namely dark and biblical, then this costume rendition of Rubens' "Saint Sebastian" put together by Redditor Pontdepierre is right up your alley! 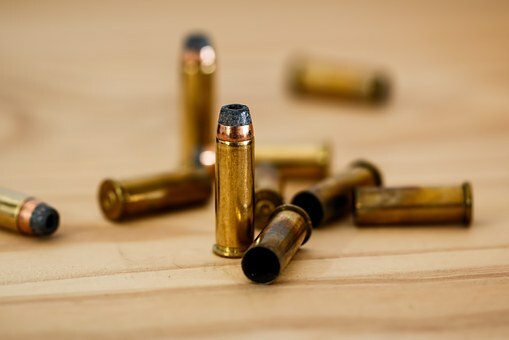 And if you're comfortable walking around with no shirt on all night this would make a great Halloween costume, although some people might think your costume has something to do with Cupid. Still, the art lovers will get it! 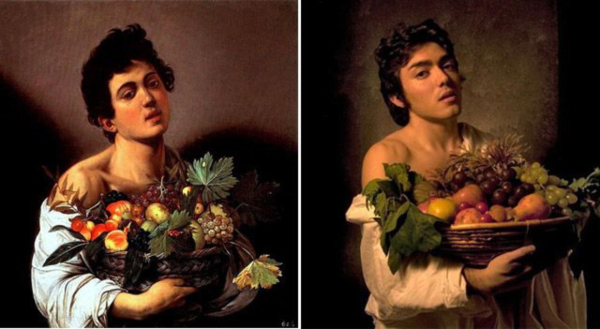 Caravaggio's "Boy with a Basket of Fruit" may seem like a strange inspiration for a costume, but it has three things going for it- the wardrobe elements are easy to put together, the costume is instantly recognizable by art lovers, and you'll be able to share your yummy fruit with everyone at the costume party! 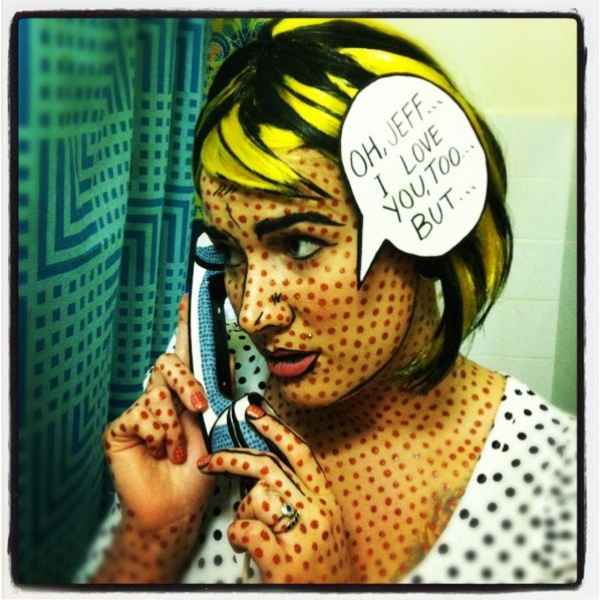 All of Lichtenstein's artworks are instantly recognizable so they make great costumes, but to really sell the Lichtenstein effect you've gotta add all kinds of dots to the ensemble and some comic art makeup to give you that illustrated look. 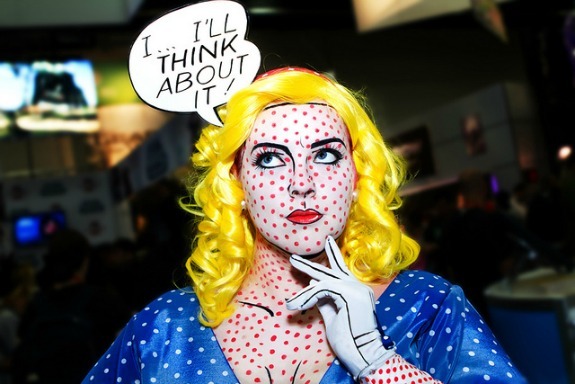 It also helps if you add a dialog bubble like the cosplayer in the photo above did, so people will recognize the specific Lichtenstein work you're representing. Plus, this bubble will serve as a conversation starter all night long, especially if the person you're talking to happens to be named Jeff!